Thanks to NBC's struggles with the failed Jay Leno experiment, one of my favorite shows, "Chuck" went from the renewal bubble to having an extended third season this year. (Thankfully, the show was picked up for a fourth season without any drama this year, though I suspect it may be the last for Team Bartowski). The season went from 13 to 19 episodes and instead of padding out the arc, the producers decided to still finish the first arc in 13 and then have a new arc for the final six. Well, sort of. In a lot of ways, it feels like the first 13 were a long prologue for the final six, most of which were a home run and finally got Chuck and Sarah together. Thankfully, the show hasn't quite yet decided to come up with invented reasons for the couple to separate and I have faith that won't happen next year. Instead, we barely got a lot of time for Chuck and Sarah to settle in to couple-dom before things started going haywire. Chuck found out the new Intersect had some nasty side effects and while this was interesting, it felt a bit rushed in some moments. I liked it, but I wish we'd had an episode or two more to develop it or to have Christopher Lloyd as Chuck's government imposed therapist be around for more than one episode. It was all to get us to the end point of the season and the spectacular finale (possibly the best of the season finales I've seen) but it still felt a bit rushed. I realize the producers wanted to tell the complete story and when the news came for an extended season, their hands were tied in terms of where they were storywise. It was still intriguing, fun and it felt like "Chuck" at its best. And the season finale brought together a lot of great threads to a satisfying conclusion...don't get me wrong. I guess I'm greedy and I wanted more "Chuck." A full season order would have made it easier and given how badly NBC fumbled just about every other prime time experiment this year and we had two weeks of repeats anyway, why not just give us two to three more episodes for a full season run? Ranting over. I liked season three and am looking forward to season four. I am curious to see if and how long Chuck stays retired (I give it one episode) and then to see who will play Chuck's mom. They hit a home run with Chuck's dad and if they can get a triple out of the actress to play Chuck's mom, this could be good. So, the eighth worst day of Jack Bauer's life has come to a close and with it, the series as a whole. I stopped commenting about every episode mid-way through the season, but that doesn't mean I gave up watching. I still faithfully tuned in because with 24, there's always the potential for that one episode or moment that will just come out of left field and surprise you. Unfortunately, I don't think that necessarily happened this year. Too many of the twists were so tossed in without much thought that they ended up not making sense. The biggest one was the sudden turn mid-season to make Dana Walsh from a woman trying to escape her past into a secret mole for the Russians. I balked at the scene as she's helping the terrorist cell get away by using her bluetooth attachment and muttering under her breath. Yes, I know CTU is tense, but come on already! That's a bit much to take. Also, we never really got any real clarification on whether or not part of her mole role was to seduce Cole and possibly use him to learn more information. Did she really love him? Is it part of the act? I get that in the heat of the day, these questions may not come up, but it would have been more interesting had they occurred to anyone. Then we got to the final six hours when Jack goes rogue and takes on CTU, the FBI, the CIA, the Russian government and anyone else who gets in his way. It's nice to see Charles Logan back, being slimy and duplicitous. It was nice to see him try to take advantage of the situation to win back power and to possibly get some measure of revenge on Jack. But...and it's a big one here, the end of the day saw Jack trade in his ideals for revenge. I realize it's the culmination of eight years of story telling and Jack's frustration at the president for the cover-up, but when the day starts with Jack wanting to retire and hang out with Kim and his grandchild, it seems odd that at some point this thought didn't cross Jack's mind. It eventually does in the final moments as we say farewell to Jack, but somehow it should have occurred earlier. I realize that Jack has a deep connection to Renee Walker, but she's not the first to have her life ended or destroyed by orbiting too close to planet Jack. Just as Jack is corrupted and eventually compromised, so also we see President Taylor go down the path of vanity, blinded by her place in history and her obsession with the peace treaty. Bring in Charles Logan and that will happen. But it was nice to see her at least try to salvage something, though the ending with a president in disgrace was too clearly a bit of a repeat of when Logan went down. And yet the ending made me wish that the show would somehow break it's real-time convention in the end to give us a coda. I wanted to see Taylor have to step up and take the blame for what she's done. I want to hear Ethan come to her in prison and tell her I told you so and offer his council. I want to know if Logan will live or die--it's implied he could live and that he failed even in taking his own life. I want to know if Jack got away. I want to know if the bad guys will target Chloe and her family now for helping Jack. In the end, the show wrapped up some things, said farewell to Jack but left too many threads dangling to really be as satisfying as I'd hoped. It was a decent season and it had some interesting points. But it wasn't quite the victory lap a show like 24 deserves. One of the most popular quotes from Sherlock Holmes is the adage that when you eliminate the impossible, whatever is left, no matter how improbable is the truth. When "Lost" first hit our screens six years ago, the first assumption was that everyone on the plane had died and were in some kind of purgatory area, waiting to move on to the next life. As the season progressed, we found that certain people died or left the island when they'd completed or made peace with whatever they needed to make peace with. I floated this theory at the time, when it related to the death of Boone and it was underscored by other deaths over the course of the series. And then, we get the grand finale...after six years of waiting, wondering and having red herrings, the series basically comes down to creating a place in purgatory for everyone to get together and move on to the next life. And, again, it comes down to characters having to let go of the things that hold them to this world. It end where it started--with an injured Jack, lying on the island looking up the sky. The series begins when he opens his eye and ends as he closes it. Along the way, Jack had to go on a journey and let go of his father and the anger he held toward him. Again, my early theory that the island was a massive group therapy session where each person had to get over his or her issues relating to their father proves kind of true. We had mystical explanations, the Dharma Initiative, the sub and lots of other stuff that came up, but in the end, the show was all about the characters moving on and letting go. Each person had to go on a journey. All that said, I'm not sure I'm entirely satisfied with the finale. It was nice to see the montage of familiar faces and the last hour felt like a huge victory lap for the show, more than resolving anything. Somehow pulling out the plug reset the island and de-powered Smokey as Locke. I'm still not quite clear on it, other than we had to find a way to dispatch the evil and not allow it to escape. I think maybe a re-watch of the show may give me some greater insight, but in the end it felt like Smokey was as an obstacle until Carlton and Cuse decided to move him aside or that they'd painted themselves into a corner with making Smokey so powerful that you had to do something to power him down a bit in order to dispatch him (see also the Borg in "Star Trek"). I'm not saying the finale was terrible. And I'm sure there are lots of fans out there, crying, screaming and wailing that it wasn't exactly what they wanted. However, it wasn't an instant classic that it could or should have been and while it's not one that ruined the series, it's one that ended with a whimper rather than a bang. I wondered yesterday if this finale could be as satisfying as "The Shield" finale was and, I've got to say, I came away feeling that it wasn't. That finale worked because while it didn't resolve every plot thread the show had created over seven years, it still gave a sense of closure to the central plotline of the show and, ultimately, helped crystalize exactly which arc story was the most important from day one--the fall of Vic Mackey because of his actions in the pilot. Vic didn't get his due until season seven, but watching the noose slowly tighten made for one hell of a ride over seven years. I definitely need to take some time off from "Lost" and then it may be time for a long rewatch of all six seasons of DVD. Because while the show did have a dud or two in there, it's still one of the more ambitious and entertaining series of the past couple of years. I have a feeling that no matter how it ended, we wouldn't have been happy. I'm just thankful it got to end and wasn't pulled after six episodes. The journey may have been frustrating at times, but in the end it was worth the ride. If you've missed all six years of "Lost" and want to tune in for the series finale tomorrow night, here's quick, funny catch-up video featuring cats. Growing up, I loved "Star Wars." It's a sentiment that's shared by a lot of people of my generation and rightly so. I saw the original entry during its first theatrical run--I think my mom and grandfather took me one summer when I was visiting Memphis. I recall loving it and being even more intrigued when I heard a sequel was coming out. Back then, I didn't know about theatrical runs, opening dates and all of that. 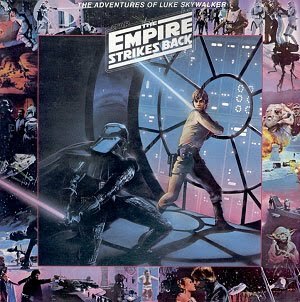 I just knew that a new "Star Wars" movie was coming and that it was called "The Empire Strikes Back." And I knew that I wanted to see it. And I did see it--several times during the summer of 1980. I'm not sure how many times I saw it, but it felt like a bunch. I'm fairly sure I saw it at least once with each set of grandparents and I also recall when the movie finally arrived at the base theater, going with friends and waiting in a huge line to get in. The base theater showing was memorable because I remember when the huge yellow "Star Wars" logo appeared on screen for the first time, the entire theater erupting in applause. I clearly recall lots of debates with friends about the big revelation at the end of the movie--that Darth Vader was Luke Skywalker's father. Whether this was accurate was something that divided my friends and I. I recall being firmly in the camp that Darth Vader couldn't be Luke's dad for a long period of time because he was a bad guy and bad guys lie. It probably didn't help that I had a copy of the soundtrack on vinyl and could listen to it a lot, trying to determine if Darth was telling the truth or not. I'd got the soundtrack the summer the movie came out, after I requested my parents buy me the "story" of the movie on record. I thought they'd get me the smaller record but instead they came back with an LP vinyl that was called "The Adventures of Luke Skywalker: The Empire Strikes Back." It was music and dialogue lifted directly from the movie with some narration thrown to help you keep up with the story. And I think I might have worn out the record--I recall listening to it on my Granny's stereo, with the fold out images from the movie there, helping my imagination run wild. It's because of this record that I have large, unusual chunks of the movie memorized like the totally random line, "Lando's not a system, he's a man...."
I found an image of the record cover on-line and it's pretty cool. I wish I still had it because the cover art work is pretty cool. If you want to check out the interior with the panels, you can HERE. Now here it is 30 years later. And I still love this movie. To my seven year old mind, nothing was better than "Star Wars," but as the years have gone by, that opinion has changed. "Empire" is my favorite of not only the original trilogy but also the entire saga. I'll even be bold enough that outside of "Star Trek II" it's the best sequel ever made...even better than "Godfather, Part II," which is held up by many as the greatest sequel of all time. Sure, it's a good movie, but it's really long and while both have character development, "Empire" has epic space battles. And that cool battle on Hoth. And now, the movie is 30 years old. As I was re-watching the movie again a few weeks ago, I was, once again caught up in the breathless excitement of watching it all unfold the first time. No, I can't ever replace one of the biggest twists in all of movie history (I often wonder if they'd have been able to keep the Darth Vader revelation under wraps today), but there's still so much in there that I enjoy it every time. Like all the great movies, it's one that almost immediately after I'm done watching it, I want to start over and watch it all over again. (Especially the asteroid chase sequence). But that still doesn't take away from my love of this movie. And my joining the world-wide celebration of one of the greatest movies of my generation and all-time. And, yes, I do feel old, knowing I saw this one in theaters during its initial run. But my fond memories of it and all the cool toys I collected related to the movie more than make up for it. For the past week and a half, Tennessee has been dealing with the impact of and recovery from record flooding. I watched the flooding unfold across the Nashville region and the entire state on television last weekend, glued to the coverage like I was on 9/11. But as the rains began to stop and the Cumberland River crested and then began to slowly recede, I watched something else unfold...the true Volunteer spirit of Tennessee kicked in. While the state and federal government were rapid in their response to the helping our great state, I was even more encouraged by the signs that a lot of people were stepping up to help out. I was encouraged that the hand out wasn't one looking for a something but a hand out to help your neighbor, a stranger, your fellow citizen. There were some reports of a bit of looting, but it wasn't as widespread as in other cities and we have had a few boneheads who seemed to think early on that water rationing meant not taking a shower or flushing and that detailing your car was totally cool. Section 303 put up a post We Are Nashville that has become a rallying cry for the community and I love the response. I even have to give props to Vanderbilt athletics (something I NEVER do...) for the way they're responding. Tomorrow nights baseball game is free and it's a big game with the Commodores taking on nationally ranked Louisville. Donations will be taken for the flood victims with all proceeds given to help those impacted by this tragedy. I've been moved by what I've seen and heard. I've tried to help where and when I can and I encourage you to consider helping out. It doesn't have to be a huge thing--just a simple thing can and will help. We haven't got the national media attention that other natural disasters have, but a lot of that I chalk up to the way our city and state has reacted to this...it's a disaster yes, but we're not sitting around waiting for someone else to help us. We're taking up this challenge and together working to rebuild. I've said it a lot during sports seasons, but I think it applies here as well.. It's great..to be... a Tennessee Vol! Unlike "Avatar," I couldn't wait to see "Iron Man 2." So, like a lot of other movie-goers this weekend, I went out to take in the latest superhero movie. And, for the most part, I liked what I saw. After the success Marvel has had with second installments in superhero franchises ("Spider-Man 2" is the gold standard of superhero movies in my book, "X-Men 2") I had high hopes for the second Iron Man installment. And while it was good, the first time I out I found it was lacking the focus of the original installment. Part of what doomed "Spider-Man 3" and the later 90's Batman installments is on full display here-- an overloading of characters and potential threats. In this case, it's the script's need to shoehorn in both Justin Hammer and Whiplash. I realize why this was probably done--Whiplash is visually cool and would look good in the trailers while Hammer offers an adversary for Tony Stark to go up against in the political and industrial arena that dominates much of the film's running time. Seeing the clash of wills and egos of Stark and Hammer is fun, especially in scenes where the two chew scenery together or play off each other. And while Whiplash is well done, his screen time as a threat and taking on Iron Man is pretty short overall...and he's far too easily dispatched on-screen. What should have been an epic battle instead ends up as a coda or an afterthought in some ways. It's almost like we couldn't have Whiplash left running around as the film ended, so we had to find some way to dispatch with him once he'd ended his usefulness to the script. Now, don't take all of that to say that I didn't like the fan or--heaven forbid--think it's along the lines of "Avatar" which was visually stunning but a hollow film. "Iron Man 2" works fairly well and it's a lot of fun to see Robert Downey Jr. once again inhabit Tony Stark on the big-screen. One of the better pieces of casting done in the past couple of superhero movies in my not so humble opinion. And there are some genuinely thrilling moments like the first clash with Whiplash in Monaco. There's also Don Cheadle, who does a nice job as Rhody, but isn't quite given enough to do in this film.